Wed., Feb. 8, 2012, 1:53 p.m. The foundation, which Sali and his wife Terry formed on Jan. 25, will work to educate the public about “foundational principles and history of the United States,” the bill says. Sali said it’ll do things like give away copies of the Constitution. Under the bill, the additional fees for the plate of $35 initially and then $25 per year would go to the Idaho foundation, except for $13 from each that would go to the state highway account. That means the group would get $22 from every plate sold, and $12 from each renewal. Rep. Phil Hart, R-Athol, moved to introduce Sali’s bill, and Rep. Linden Bateman, R-Idaho Falls, spoke out in favor of it. “As you know, some of our federal courts have been trying to eliminate the reference to God in our Pledge of Allegiance,” he said. Sali responded, “It’s an Idaho nonprofit corporation. It’s one that my wife and I started. … My wife and I are on the board with another person, and there’s a lot of shaping that will take place to make all of this work.” The other person is his nephew, Travis Pascoe of Nampa. 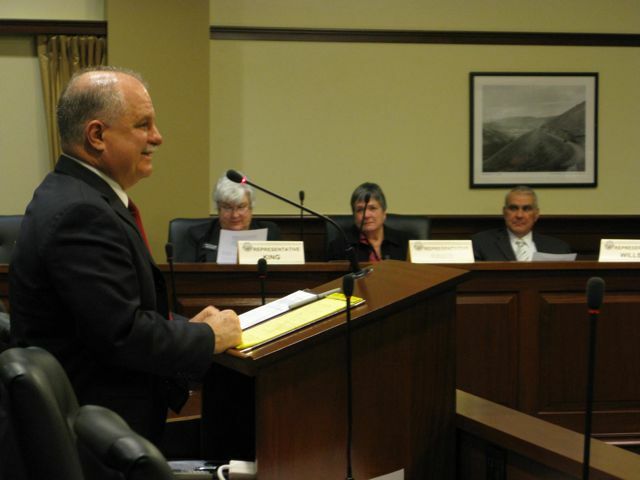 King said those materials are available many places, including the Idaho Secretary of State’s office; the committee then voted to introduce the bill, with King casting the only no vote. Rep. Shirley Ringo, D-Moscow, said after the vote that while she supported introducing the bill, she wants more information about the organization when it comes up for a full committee hearing, the next step. Sali said the couple formed another group last year, “Preserving America’s Legacy Foundation Inc.,” and then changed it to the current name in January. State records show Preserving America’s Legacy Foundation Inc. was incorporated as an Idaho nonprofit on Nov. 29, 2011, with a Kuna address and Terry Sali as its registered agent. Sali said 11 states now have specialty license plates bearing the national motto. “If people don’t understand that our national motto is ‘In God We Trust,’ we have a long ways to go,” Sali told lawmakers. In at least three of those states, Indiana, South Carolina and Kentucky, the “In God We Trust” plates don’t benefit any cause - they cost the same as regular license plates, and residents can just choose them as their plate design. Just since 2011, more than 50,000 have been sold in Kentucky. Idaho’s 30 specialty license plates raise $1.6 million a year for various groups, from the state Fish and Game Department’s wildlife programs to the Appaloosa Horse Club and the Valley Corvette Club. The same committee that introduced Sali’s bill on Wednesday also killed a measure from Sen. Jim Hammond, R-Coeur d’Alene, to limit future specialty license plates; Hammond’s bill had earlier passed the Senate on a 31-2 vote. Published: Feb. 8, 2012, 1:53 p.m.